At just 13, Calder Trotz has been to more “high stakes” competitions than many riders twice her age. She’s contested the USEF Pony Finals twice and has shown at esteemed venues like Devon (Pennsylvania), the Pennsylvania National and Capital Challenge (Maryland). 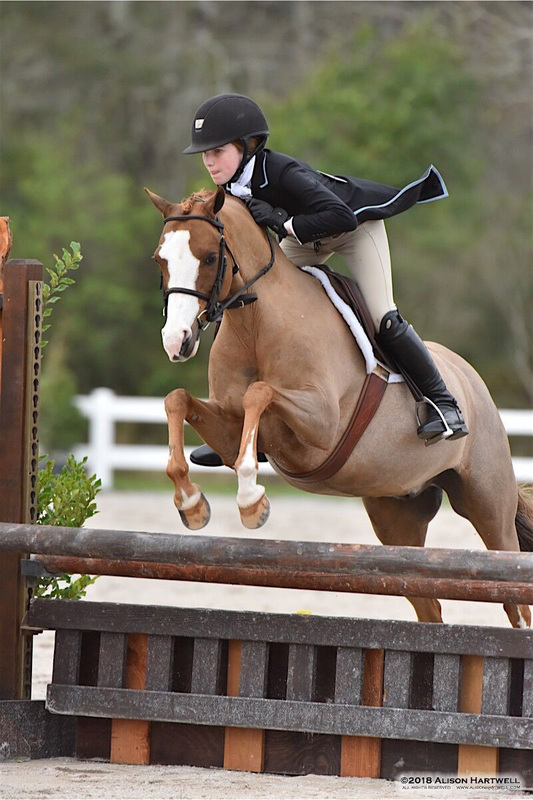 So when she found herself standing in second place heading into the handy round at the USHJA Pony Hunter Derby at the Gulf Coast Winter Classic Series III on Feb. 23, she did what she always does when she feels the pressure mount. She took a deep breath. Trotz’s focus paid off; she expertly piloted her 12-year-old medium pony, Not So Secret, through stylish inside turns while maintaining their signature smooth rhythm to each fence. Their effort earned a score of 73 for the handy round, which brought their total to 153 and won them the blue. But more importantly, it gave the relatively new partnership valuable experience as they strive toward attaining some lofty goals. Trotz started riding at Spring Mill Farm in Eads, Tennessee, about a 30-minute drive from the family’s home in Memphis. Within two years, she graduated from the lesson program to the show team, and she began working with head trainer David Pelligrini. After Trotz got local show and short-stirrup mileage on her first pony, Oreo, Pelligrini helped the family find Brownland Miss Kimmy, on whom she competed in the small pony hunter divisions and equitation classes throughout the East Coast. Oliver won the green pony championship at the Pony Finals in 2016 with Kyla Sullivan riding and finished fourth there in the regular medium pony division in 2017 with Brynn Kuhnell riding; he was already qualified for the major indoor shows when the Trotz family purchased him. Oliver is known in the barn for his quickly changing moods and his appreciation for Chex Mix. Trotz and the 12-year-old liver chestnut gelding by Tapu Kid McCoy spent the fall season getting to know each other by earning ribbons at the Capital Challenge and Pennsylvania National, as well as winning the stakes class at the Washington International (District of Columbia). Trotz plans to keep Oliver in Gulfport for the rest of the series, which ends in mid-March. Her immediate goal is to qualify for Devon, but this summer, she’s aiming to be in the ribbons in the over-fences class at Pony Finals—one goal that has eluded her so far. Both she and Pelligrini are optimistic about their chances on both of these fronts, but Trotz notes that she and Oliver still have some work to do. They compete in the pony equitation medal as well, choosing to stick to the smaller height courses in the pony classes where Oliver is more comfortable, rather than moving up to the age-division equitation, which starts at 3’. And in the down time, she remembers to take a deep breath, and that it’s also important to have fun.